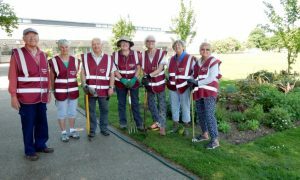 Friends of Woodford Park (FoWP) is a group of volunteers who have come together to help improve our park. They have short, bi-monthly, evening meetings in the Oakwood Centre and meet up whenever needed for specific tasks. This can be during the day, at weekends or in the evening so there is bound to be a time that will work for you. 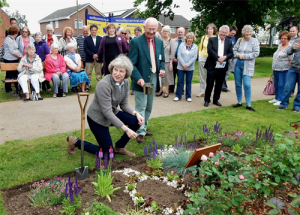 Their first project was to create the flower beds near the War Memorial celebrating the Queeen’s 90th Birthday. The official opening was performed by local MP the Rt Hon Theresa May in June 2016. ‘RHS Britain in Bloom’ have recently recognised their community involvement and gardening achievement with awards in 2016 and 2017. The group already have plans for other areas of the park and are always open to new ideas. This year the FOWP have teamed up with the local Rotary Club to rejuvenate the sensory garden and the planting of crocuses for Polio Campaign. There will be something to interest everyone as FoWP hope to have our park looking outstanding for it’s centenary year in 2019. If you would like to join the group or learn more please email: fowp.woodley@gmail.com or telephone David Provins on 0118 9693698. Everyone is welcome, whatever your age, ability or availability. They are a friendly bunch and this is a great way to meet local people. You can contribute ideas, do some gardening, encourage wildlife or even become a volunteer park warden. There are always opportunities to enhance your CV, give you exercise, learn new skills or pass on your knowledge and experience. Friends of Woodford Park volunteers.